Greenfield have introduced Tag Rugby to its school curriculum for 2015 in the Spring Term. Tag Rugby is is a non-contact team game in which each player wears a belt that has two velcrotags attached to it. Attacking players attempt to dodge, evade and pass a rugby ball while defenders attempt to prevent them scoring by "tagging" – pulling a velcro attached tag from the ball carrier, rather than a full contact tackle. 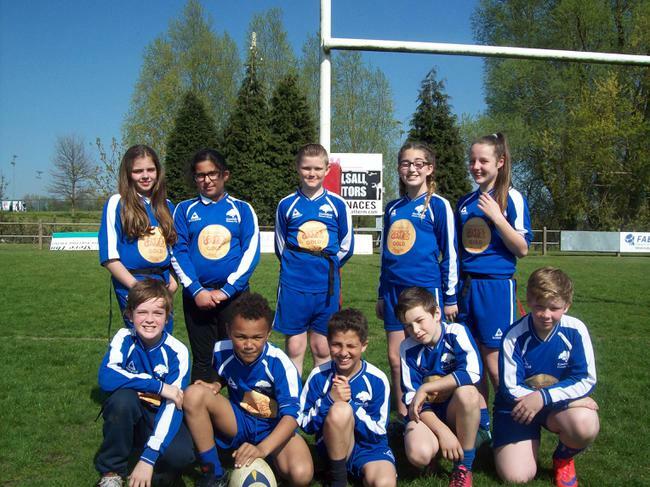 Greenfield entered the Walsall Schools Rugby Competition at Bloxwich Rugby Club and were successful in winning the area section of the competition. They then went on to play in the final for the whole of Walsall and finished fourth overall. The game of TAG Rugby should be enjoyed by all involved. To help create an environment for this to happen it is important that we remember a few ethics of sport. Recognise the importance of fun and enjoyment for all involved. Play fairly and by the rules of the game. Be positive with the referee and develop a team respect for them. Don’t argue with them or constantly question their decisions. Remember, they are unpaid volunteers giving up their own free time. Without them there would be no game! Be a good sport - applaud good play whether from your own team or your opponents. Help create an enjoyable environment in which to play the game. Do not ridicule or shout at players who lack ability or make mistakes. Support all efforts to remove any verbal or physical abuse from the game.